We are exited to announce another feature-packed SharpTools.io platform update. Today’s release includes a number of awesome new features like color control as well as some powerful feature enhancements based on popular user request. Ready to wow your friends and family with the power of color? 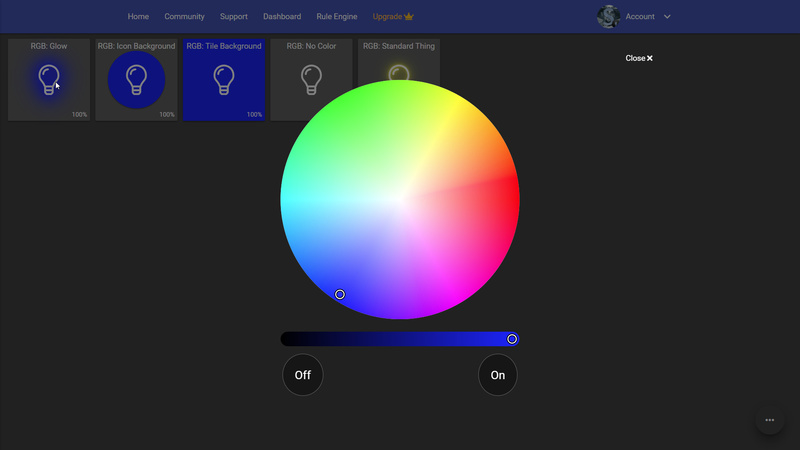 Today’s platform release includes an all new Color Control tile to control your favorite color bulbs, lightstrips, and color enabled devices. By default, the Color Control tiles show a nice glow of color to match your color device. There’s also options for how color is displayed including making the whole tile color change, adding a circle of color behind the icon, or disabling color altogether. When you tap on a Color Control tile, you’ll be presented with a new color picker dialog that let’s you quickly change to your desired color, dim the level, and turn the light on/off. 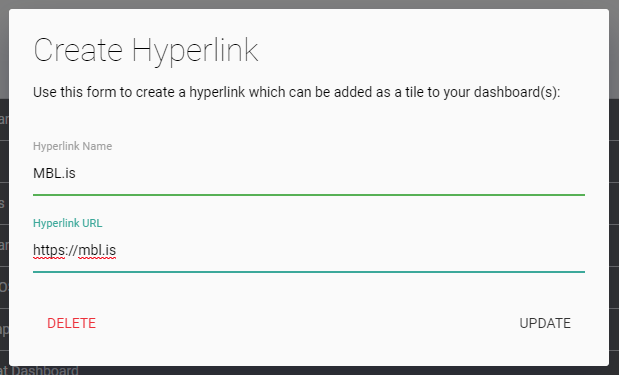 Hyperlink tiles now have an additional setting called Link Action which you can use to determine how the hyperlink is handled - open in the current window, open in a new window, or open in a modal. These new options provide additional flexibility for integrating with third party apps and platforms. Now you can choose if you want to stay immersed in SharpTools, but load content from another website… or choose between opening links in the current window or new window depending on how you like to interact with your dashboard. Here’s an example showing the Hyperlink Open in Modal option used with the Dark Sky Maps website. Media Tiles have also picked up some new tricks with the new Action option where you can choose what happens when you tap on the tile. By default, tapping on a media tile will now make the image fill the screen so you can better inspect the media item. There are also new options for making the tap action Refresh the Media as well as open a Hyperlink. The Open Hyperlink enables some really nice integrations with other applications. Like normal Hyperlink tiles, you can link to Android or iOS applications. One cool example of this would be to display an image snapshot from a camera that is periodically refreshed… then when you tap the tile it could either open the native camera application, link to your NVR, or open the streaming version of the image! Ever wanted to take some of the customizations you’ve made to a tile or even a complete dashboard and easily copy those? Now you can with the new Copy Tile and Copy Dashboard features! When editing a dashboard, if you tap the ... in the top-right corner of a tile, you’ll now find a Copy option in the drop down menu which brings up a prompt allowing you to pick which dashboard you want to copy the tile to (including your current dashboard). Similarly, when you are viewing the list of the dashboards, if you tap the ... to the right of a dashboard, you’ll now see a Copy option which enables you to make a complete copy of a dashboard. Hubitat has added a new ‘Arm Night’ action to the list of available Hubitat Safety Monitor actions. This action is now available across the dashboard and Rule Engine. 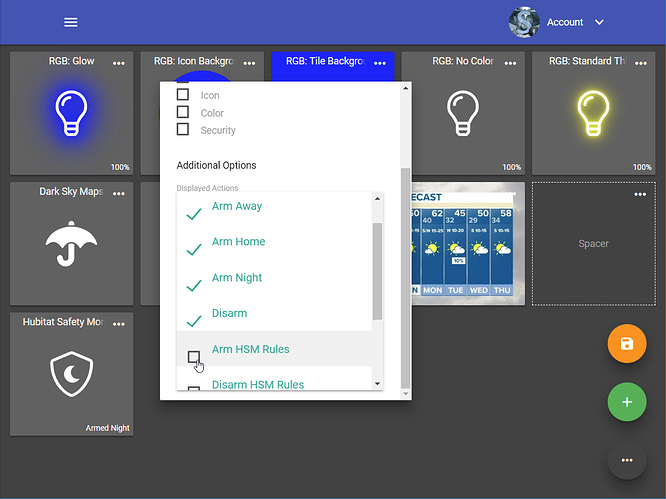 When using the new Arm Night action in dashboards, you’ll see a new moon icon to reflect the new HSM state. Additionally, we’ve added the ability to edit the HSM Picker tile to choose which actions you want to show in the dialog box that pops up. 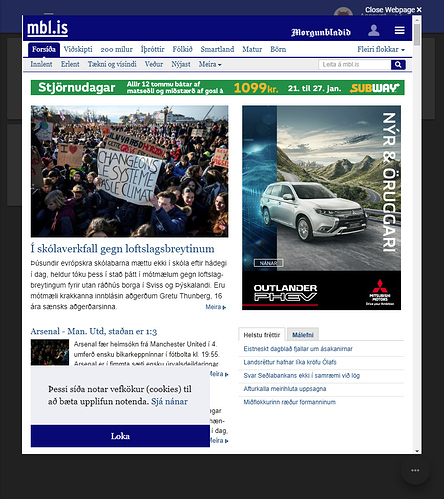 Thoughts on Media Tile options? The new features look great! Not sure if it’s just me/my fire tablet but changing the media tile option Fill/Contain/Cover doesn’t seem to change the picture display. I am trying to get the picture to display exactly as it did before the update. Thanks for the report and my apologies! I’m able to reproduce and I’ll work on getting a hotfix out. @xap Hotfix for media scaling has been deployed. Refresh your browser to pull in the newest changes. Why are the new garage (didnt test any of the others ones) icons so much smaller than the existing ones? And different shaped. The fix works in edit mode, but after I click save the images revert back to the same appearance. @xap Can you give it another try now? I made one additional tweak and tested against a variety of images with a variety of configurations (it was specifically the tap to refresh action that wasn’t properly formatting the image with the previous release). @xnbsx Thanks for the feedback. 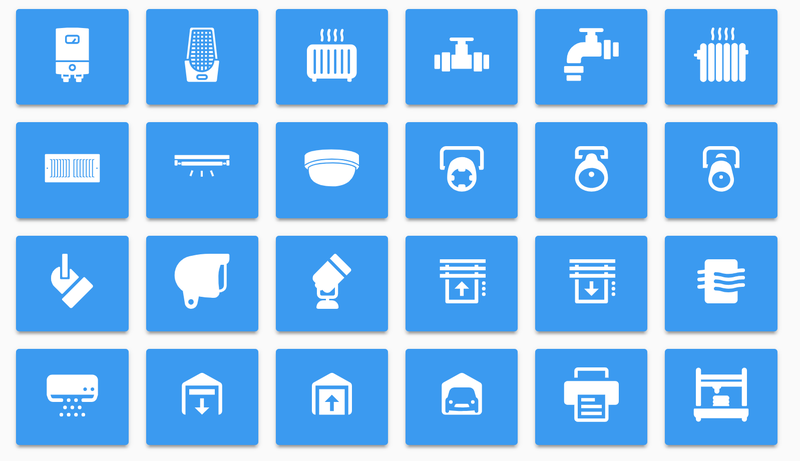 I’ll see if we can tweak the sizes of some of the new icons to better match the existing set. One improvement that would be great: the ability to set the offset against the dimension that surpasses the view window when using the Cover option. For example, I would like to be able to set my doorbell camera to cover and shift it horizontally so that only the left side of the image is cropped. I was testing out the open in Modal for Hyperlinks and it does not seem to open the sites I am testing (simply google.com and mbl.is). I then had the hair brained idea to add a SharpTools dashboard into the Hyperlink and that opens, but in an oval Modal. Any idea what is going on here ? BTW: I actually like the idea of being able to open a dashboard as a modal. Gives certain opportunities. Some websites, like Google, restrict you from being able to embed their website in another website. Wow! The oval is an unexpected result of one of the existing CSS styles. I was able to reproduce and I’ll make sure to update the styles so this doesn’t happen going forward. That is a good point that being able to open other dashboards in a modal could make for some really cool use cases! That’s interesting. I can´t get mbl.is to load on my end. I’ve tried both Chrome and IE. Hm. That is indeed odd. Usually if they block embedding, it’s blocked for everyone, but I suppose they could be blocking embedding only in certain cases (eg. like based on your IP address or something). Edit: Scratch that… make sure you are using the https version of the URL: https://mbl.is otherwise it won’t load. Yes, indeed it works with https. Is that a requirement or just for this particular page ? Yes, most modern browser block ‘mixed content’ and since SharpTools.io is served securely over SSL that means that embedded sites will need to be served over SSL as well. Rock on, brother! Icons are like excuses, you can never have too many to choose from!!! I’m all over that glowing icon thing, and also the poo icon designated for the back porch, that’s where I go too!!! @Kristjan_Ulfsson we released a hotfix last Friday that included a fix for opening other SharpTools.io dashboards in a modal. You should be able to link to other dashboards and open them in a modal now without the oval/circular effect. Keep in mind that you can append ?kiosk=true to your dashboard URLs to hide the navigation. @josh am I missing something for color light control, how to I control warm white light control? I see the RGB wheel and a brightness slider but no button to go to white mode or something like that. On my one device it’s a completely different channel which the Hubitat device takes care of. I think temperature usually takes care of this? I could be wrong.